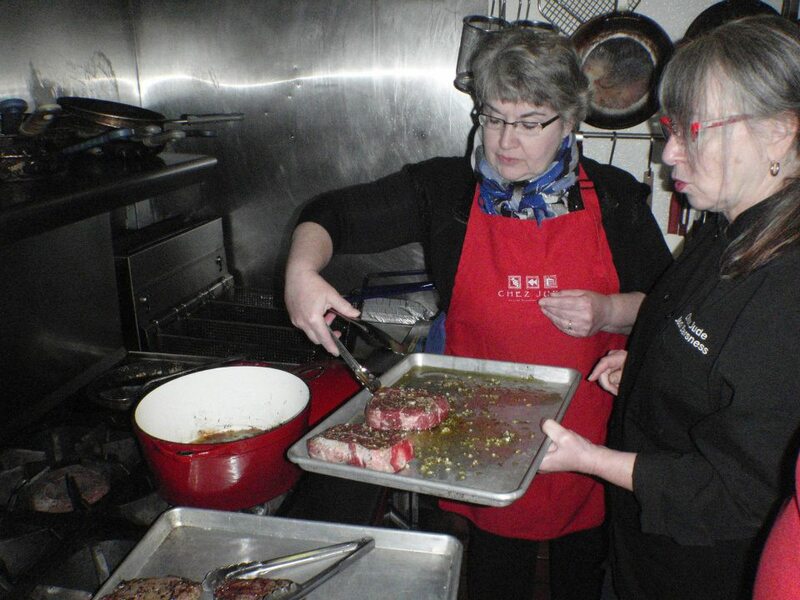 One terrific way to keep the creative juices flowing is to take a cooking class. Whether novice or experienced cook, you’ll come away with new ideas and greater understanding of what constitutes good eating. We did just that this weekend, traveling up to Grand Marais for a French cooking class (see photos below) with second generation French chef Judi Barsness of Chez Jude. We stayed at the MacArthur House B&B, took in some of the north shore night life and spent five delight-filled hours with Judi. Judi grew up in her mother’s French restaurant (Frenchy’s and later Fleur de Lies) in Milwaukee. She learned her mother’s techniques and then sailed off to expand her cooking repertoire as sous chef in a 16th century manor house in England, studied at the Culinary Institute of America and the National Baking Center, interned with Alice Waters at Chez Panisse (California), and became the chef at Bluefin Bay resort on Minnesota’s North Shore. Eight years ago, Judi struck out on her own, purchased the building that had been a bakery and opened her own restaurant and cooking school. Judi’s husband Peter, who was instrumental in establishing North House Folk School helps out in the kitchen and delights guests with tales of his sailing adventures on the lake. After introductions, we jumped right into chopping, slicing and dicing. We coated the short ribs with herbs de Provence rub, browned diced bacon in a Dutch oven and then seared the meat on both sides. Adding a host of delicious ingredients to the pot, the meat went into the oven as did the cubed butternut squash which was destined for the salad. We combined apple cider, cider vinegar, and shallots, cooking them until the liquid was reduced by half. Then we whisked olive oil, Dijon mustard, salt and pepper into the liquid to finish the vinaigrette. Of course, we were thinking how Leatherwood Vinegars could be used in place of the cider vinegar and how they would influence the final flavor. Potatoes, rutabagas and parsnips were diced, cooked in water, lightly mashed with milk and butter and then spread in a baking pan. Topped with cheese and additional butter, this gratin baked in the oven until golden brown. The chocolate dessert of bittersweet chocolate, butter, sugar, tawny port, vanilla and a small amount of flour was baked in generously buttered ramekins placed in a pan half-filled with water. We began eating our four course dinner, each paired with wine, at about 12:30. We savored both food and conversation (Peter joined us) while Judi continued to flit in and out of the kitchen, attending to the final details of our meal while prepping and taking reservations for later in the day. Judi is excited about trying some of our vinegars in her menu. As her website says, “Chez Jude's menus reflect her commitment to the freshest offerings of the Minnesota seasons, organic, locally grown, harvested, wild caught, handcrafted ingredients.” That philosophy fits right in with ours. We also discussed how we might pair our cooking skills with hers in class offerings at the North House School. Friday night, our B&B host Max Bichel joined Pete Kavanaugh down at the Gunflint Tavern. With Max on the violin and Pete on guitar, they played a sampler of country music featuring the music of Willie Nelson, Johnny Cash and others. Max coaxed a great variety of delightful sounds out of his violin, pleasing his audience and one little dog snuggled on his master’s lap. We returned to the Tavern Saturday night and joined a table of diners only later to learn they were members of the Bluegrass band The Moss Piglets who then played from 9:00 to midnight. We were back in our cozy beds at the B&B long before midnight. Saturday evening we also sampled the food at the Crooked Spoon. We were so full from the good food at the MacArthur House and Chez Jude that we simply nipped into the appetizers, salads and the puff pastry topped onion soup. They were all delectable and judging by the full tables, it’s top of the list for the locals and visitors alike. We’re back into the work week, now, refreshed, rejuvenated, and excited about trying new cooking techniques in our kitchen. We’ve had a call from Bon Appetite Management ordering a good amount of vinegar for their catering service and one from a community planning their summer festival and inviting us to bring vinegar. We’ve also had a call from daughter number five saying a semi’s actions put her in a spinout on the snowy freeway causing a three car pile-up. She was on her way to interview for a summer internship at an organic farm. The front of her car has taken on a new shape and her right front signal light is dangling. She’s OK and will still try to make it to the interview. 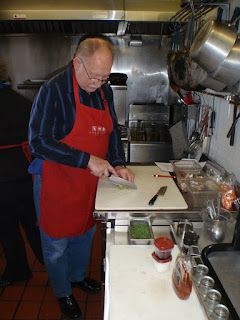 Ron expertly slices and dices at his work station in the kitchen of Chez Jude. Nancy and Judi add the short ribs to the Dutch oven. Photos courtesy of Dawn Tanner. Ron has been so busily bottling vinegar that he broke the corker. Our vinegars are all made in small batches and we haven’t gone the route of using a huge mechanized process for bottling. Each cork is inserted into a bottle by the use of a corker that holds the bottle and positions the cork correctly. Then it’s Ron’s muscles and the leverage of a handle that squeezes the cork into the bottle. He’s just bottled strawberry, cherry, and Serrano pepper. Strawberry was one of our first vinegars back eight years ago. It’s nice to have a good supply again. Cherry is always in demand. Serrano pepper, while not our hottest vinegar, is a zippy one and a good seller. This afternoon, I handled the waxing duties on seven (twenty-four bottle) cases. While it might be good for a wine to breathe through a natural cork, air can stimulate continuing mother formation in the bottles. It’s perfectly harmless, even desirable as a sign of natural vinegar. That's fine but we'd rather not have too much develop between the time we bottle and someone uses it. A layer of beeswax fully seals the bottles, deterring any additional “mothering.” Each bottle is hand dipped in melted beeswax. It’s a pleasant job with the sweet honey scent of the beeswax and the satisfaction that comes with producing our distinctive Leatherwood Vinegars. I’ve updated our products page with a current inventory of flavors. For those of you waiting for raspberry: Ron checked the acidity this morning. It’s up to 4.7% so we’ll give it a couple more weeks to reach full potency.